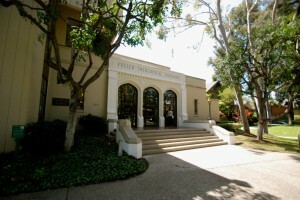 Fuller Theological Seminary is one of the largest broadly evangelical seminaries in the United States. With six satellite campuses and a virtual one, in addition to its main campus in Pasadena, California, Fuller is able to reach a large student body. The school serves more than 4,300 students, who come from over 65 different countries and represent over 100 denominations. Few theology schools are as diverse or offer as many graduate degrees as Fuller Theological Seminary. With its main campus in Pasadena, CA, just outside Los Angeles, Fuller is one of the most accessible seminaries in California. Students coming from cities in Southern California, such as Anaheim and San Diego, can reach the main campus within an hour or two. For students who hail from Northern-California cities, like San Francisco and Sacramento, Fuller’s Pasadena campus is about a day’s drive down Interstate 5. Students who are arriving from outside the state usually fly into the Los Angeles International Airport, which is about 30 miles away. Students who are considering enrolling in a seminary degree program at one of Fuller’s satellite campuses should look at the specific campus they would attend. The courses offered and degrees awarded at satellite campuses vary from location to location. (Find more seminaries in California). For students who cannot relocate to one of Fuller’s campuses, the seminary offers a flexible degree option. Through a combination of accredited online seminary classes and intensive courses taken on campus, students can complete one of three master’s-level degrees. The Master’s of Arts in Intercultural Studies (MAICS), Master’s of Arts in Christian Leadership and Master’s of Arts in Theology and Ministry are all offered through the flexible degree program. (At the time of writing, the flexible options for the MATM and MAICS were pending accreditation from the ATS and WASC). The flexible degree program lets students take their seminary courses online, through independent study or on campus. Much of the seminary degree program can be completed online, although students must come to campus two or three times each year, usually for about a week at a time. (Find more online seminary degrees). Fuller was founded in 1947 by Charles E. Fuller, after whom the school is named, and Harold John Ockenga. 39 students enrolled in the School of Theology at the time, and there were five faculty members. In 1953, Fuller moved from Lake Avenue Congregational Church in Pasadena to the seminary’s present location. In the 1960s, two more schools were opened. The School of Psychology and School of Intercultural Studies (originally the School of World Mission) were both founded in 1965. All three schools received accreditation from the Western Association of Schools and Colleges in 1969. The 1970s were a time of great expansion for Fuller. Between 1973 and 1979, six regional campuses were opened. Part of the original vision of Fuller was to repair relationships between conservative Christians and secular intellectuals. As the graduate school has grown, it has remained true to this vision. Today, the seminary draws both conservative and liberal Christians, as well as secular researchers. This mission statement reflects Fuller’s commitment to Christian beliefs and diversity and seeks to prepare students academically, professionally and spiritually for Christian service. The school’s Statement of Purpose makes it clear that Fuller is not affiliated with any specific denomination. The student body includes students from more than 100 different denominations (including non-denominational traditions), and the faculty’s theological heritage is equally diverse. On Fuller’s Role In Public Life from Fuller Theological Seminary on Vimeo. (Find more broadly evangelical seminaries). As one of the largest seminaries in the United States, Fuller is able to offer a plethora of master’s and doctoral degrees. The school sets itself apart from other Christian graduate schools by offering a few of these seminary degrees in Korean and Spanish. In addition to M.A., Th.M. and Ph.D. degrees, Fuller also confers several certificates. All of Fuller’s degrees are listed below according to the school they are awarded by, with the Korean and Spanish seminary degrees at the end of the list. 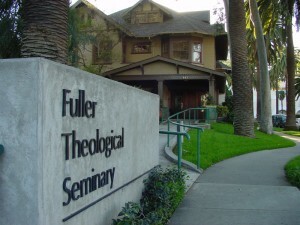 The School of Theology at Fuller Theological Seminary centers its graduate degree programs at the intersection of three spheres: the Church, the academy and society. Within this context, all of the programs complement intellectual study with spiritual formation and ministry preparation. The School of Theology offers master’s degrees, doctoral degrees and certificates in Biblical Studies, Theological Studies and Practical Theology. DMin Mentoring Component with Terry Walling from Fuller Theological Seminary on Vimeo. Students can also earn a Certificate of Christian Studies from the School of Intercultural Studies. In addition to these degrees and certificates, Fuller offers a Certificate in Urban Youth Ministry through the Fuller Youth Institute. This certificate combines studies in all three schools. (Find more seminaries with theology degrees). All of Fuller’s three schools, the School of Theology, School of Psychology and School of Intercultural Studies, are fully accredited by the Association of Theological Schools (ATS) and the Western Association of Schools and Colleges (WASC). The ATS accredits both undergraduate and graduate theology schools throughout North America. The WASC accredits both religious and secular schools at all levels throughout the Pacific Rim and in California. As the largest seminary in the ATS, Fuller has established itself as one of the top seminaries in the United States. It is able to offer a breadth of degrees that other seminaries are not able to provide, including several doctoral seminary degrees. For students seeking a seminary degree in Korean or Spanish, or a Psy.D. from a seminary, Fuller is one of the best seminaries to attend. More information about each of the schools at Fuller Theological Seminary is available at fuller.edu.